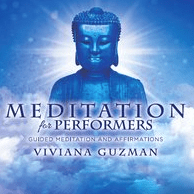 This recently-released CD by inspirational artist Viviana Guzman helps performers focus their internal dialogue in a positive, healthy way. This recording is helpful for musicians who are in the beginning stages of their development, professional performers, and everyone in between. It would be useful for those who have stage fright or those who just want to be more present and experience a greater enjoyment of the moment. Guzman’s background includes seemingly-insurmountable childhood health challenges, which resulted in her growing up in body casts and wheelchairs and left her insecure about stage performance. She eventually defied medical predictions and was able to walk, and she also overcame her performance anxiety; this success leaves her particularly well-qualified to help others overcome their performing fears, as well. Each track is approximately 15 minutes and features subtle background sounds from nature. One track is more obviously geared towards performers imagining an upcoming performance. The others are more general but still have strong connections to issues we face in performance. Some of my favorite phrases that recur throughout the first track remind us that we have “prepared our music” and “practiced diligently.” This helps to reaffirm the connection between adequate practice and successful performance. It reminds us to trust the hard work we have done and that a positive performance experience isn’t just related to chance. I will recommend this recording to my students. I think it will be helpful to them, especially those who are new to performing and are a bit apprehensive about it. In addition, I have found my own thoughts to be better focused after listening multiple times. Learn more about Viviana Guzman’s work at her website, www.viviana.org.